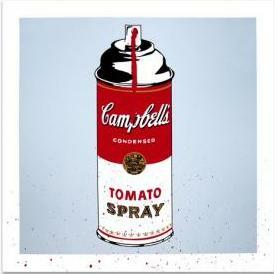 Four color screen print of Mr. Brainwash's iconic Tomato Spray. Hand torn into squares on textured archival art paper. Each print individually hand finished with spray paint, and unique. Signed and numbered, with thumb print on the back. Edition of 100. This print will also be available at Mr. Brainwash's London solo show this year.